Login and Register is a entry point of any website. So, if we want to access any web system feature then we want to make first registration and after registration we can login into system. So, Login and Registration is a required functionality of any web application. For this here we have make discuss how to create login and registration page in angularjs with PHP and Mysql. This tutorial will useful to AngularJS beginner tutorial becuase here we have discuss PHP Login Register Script by using AngularJS from scratch. This very simple tutorial which will helps to AngularJS beginner developers to crate simple Register and Login page by using AngularJS with PHP and Mysql. Because by using AngularJS we can make single page web application. So here also we will make login and register form in single page. In this single page login and register application by using AngularJS when page has been load into browser then we can only see Login page on our index page. And suppose we want to go to register page then by click to Register link then AngularJS register form will be visible on web page and AngularJS login form will be hide. After successfully register into system then we can loign into system. In Login and Register we have also use PHP server side validation with AngularJS. After login into system page also redirect to index page. So in single page we have make login page, register page and after login and enter into system also in index page. For check user login into system or not for this we have use PHP Session variable. 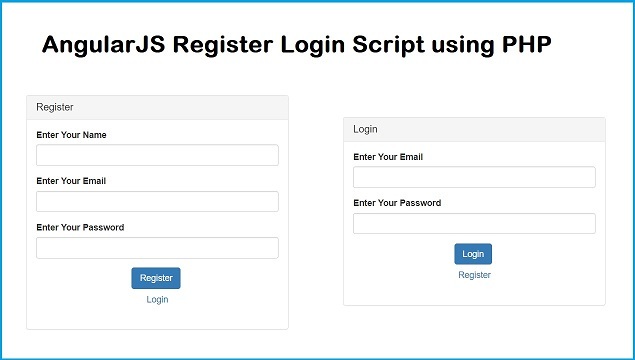 So, this way we have make single page Login Register system by using AngularJS with PHP & Mysql.